CYCA director Paul Clitheroe purchased his fifth Balance mid-last year. It was previously the 2008 Rolex Sydney Hobart overall victor, Quest, which Bob Steel also sailed to 27th overall in the 2009 race and seventh overall in 2012. 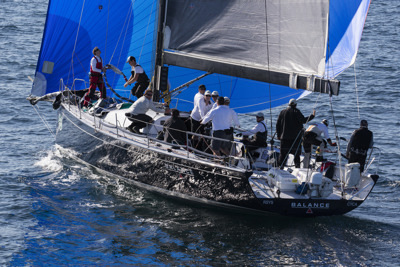 Going into the 2014 Hobart, Balance was leading the chase for the Blue Water Point Score, inclusive of claiming second overall IRC Division 1 in the 2014 Gold Coast race and winning the Cabbage Tree Island Race. When Hobart conditions smiled down on the smaller yachts, Balance finished 36th overall, but was top TP52 and therefore accepted second overall in the BWPS. Finished third on line in October’s Newcastle Bass Island Race and looked likely to win overall until the small boats sailed home in good pressure and Balance was relegated to fourth place. Clitheroe turned 60 in July, so was celebrating with others of his vintage in Ireland when Balance was sailed to 19th overall and seventh in Division O in the Gold Coast race, skippered by Mike Green, a veteran of 36 Hobarts. Finished third overall in November’s 180nm Cabbage Tree Island Race to take the BWPS lead. Previously, Clitheroe owned a Beneteau 45 also named Balance, which he also sailed with successful results. Despite his protests, the money guru does know how to race a yacht to its potential.